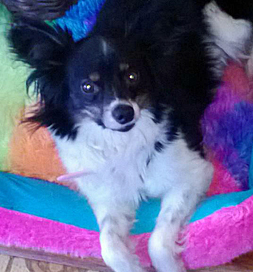 It’s hard to imagine that someone would dump a dog as if she were garbage, but that’s what had happened to Isabella, a six-year-old Papillon, before she was rescued, according to Barbara Miller. Read Isabella’s story in Barbara’s words and submit your own happy tail. When Barbara saw Isabella listed on Petfinder, her heart melted. She was interested in adopting the little pooch, but the trouble was she lived in Minnesota and Isabella was at C.A.R.E. Animal Rescue in Springfield, MO. She had tried to put the dog out of her mind, but she kept being drawn to her on the computer and finally printed a picture of her and put it on the table where she kept seeing it. At last she gave in and called the shelter. When she found that the rescue only adopted to people that lived within a sixty-mile radius of Springfield, she could have given up. But not Barbara; she persisted. When the shelter folks found that she was willing to drive so far for this pup, they relented and began a rigorous screening process. They contacted her references — her vet and groomer — and she signed a contract, agreeing that she would return Isabella to them, if the adoption did not work out. They satisfied themselves that this would be a good match. She urges people to avoid buying pets from pet stores because, she says, “many times there are puppy mills behind the scenes.” Besides, as you can readily tell by looking at the number of pets (over 350,000) listed on Petfinder, hundreds of thousands of dogs in shelters and rescue groups desperately need homes.